Uglyworld #1506 - "Ones For The Road?" (Project TW - Image 104-366), a photo by www.bazpics.com on Flickr. If you finders yourselfers travellering arounds strange lands you will already knows the importanters factor of alway makings sure that you has enough tastiers snackies to hands to lasters you to the nexters pitstopper. 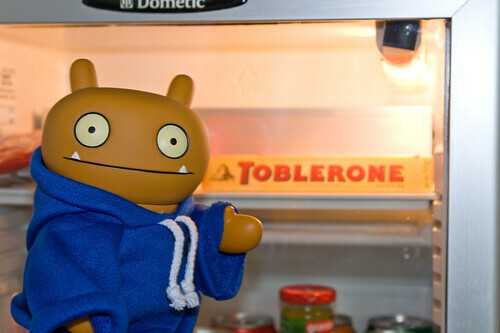 Todays we is headerings back to Germanies, so while Baz was packerings up his suiterscase this mornings I hads a littlers looky into the hotels room fridge to sees what I could finders. Toblemarone, awesomes, it's mega tastiers and it will even reminders me abouts the super coolers mountainers outside the hotels room windower as every littlers chunk of chocomolate has been makereds to looks like a miniatures mountainer! "Hey Baz, ones for the road?"